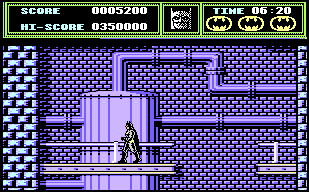 Released in 1989, Ocean's movie tie-in game, Batman - The Movie, was based around the Michael Keaton film that was released the same year. It's mainly a platform based game, though you don't jump; you use your trusty Bat-Rope to traverse the levels. There are also several pretty decent mini-games thrown in for good measure. It's probably Ocean's best movie tie-in game.